It’s All-Star basketball season once again. This time, the most valuable player is Dad! 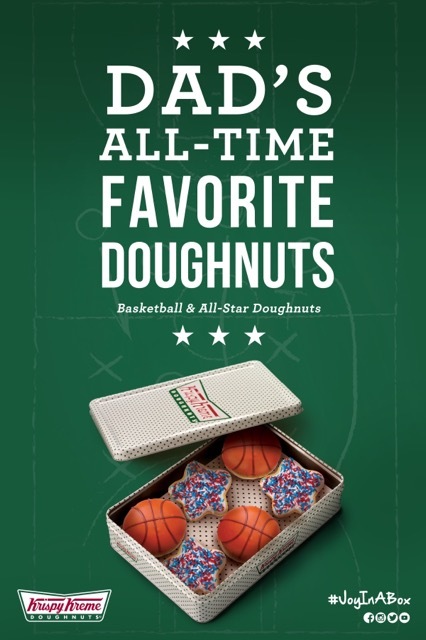 Krispy Kreme is giving Dads and basketball enthusiasts a thrilling experience in time for Father’s Day as the global brand rolls out its new line of yummy All-Star doughnuts. Krispy Kreme heightens the excitement level inside its stores with an epic All-Star challenge for dads and Krispy Kreme customers – to shoot 6 miniature balls inside 6 cups in 30 seconds. The dad or Krispy Kreme fan who succeeds will bring home an amazing treat of 3 All- Star doughnuts for free! “This season is a very exciting time for us at Krispy Kreme. We celebrate Father’s Day and bring families closer together through the things that they love – basketball and sweet, delectable Krispy Kreme doughnuts! Every time customers step inside our store and enjoy their favorite treats with their loved ones, they create a delightful and unforgettable Krispy Kreme experience,” shared Ariane Valinton, Marketing Manager for Krispy Kreme Philippines. Krispy Kreme beckons its customers to drop by its stores and sample its mouthwatering All-Star doughnut topped generously with red, white and blue sprinkles, and its lip-smacking and caramel-filled Basketball doughnut variant. These exciting treats for Dad are available from June 8- 21 at Krispy Kreme stores nationwide. Check out Krispy Kreme on Twitter, Facebook and Instagram or log on to www.krispykreme.com.ph for the latest Krispy Kreme update. #KKAllStarDad. Krispy Kreme is an international retailer of premium-quality sweet treats, including its signature Original Glazed® doughnut. Headquartered in Winston-Salem, N.C., the Company has offered the highest-quality doughnuts and great-tasting coffee since it was founded in 1937. Krispy Kreme is proud of its Fundraising program, which for decades has helped non-profit organizations raise millions of dollars in needed funds. Today, Krispy Kreme can be found in over 925 locations in more than 20 countries around the world. Krispy Kreme is listed on the New York Stock Exchange (NYSE: KKD). Visit us at www.KrispyKreme.com. This entry was posted in Cakes and pastry, Dessert, Occasion, Press Release and tagged Father's Day 2015, Father's Day promo, krispy kreme, Krispy Kreme donuts on June 11, 2015 by Yami.